S Pius V: "whoever enters through the gate is the shepherd of the sheep"
Even God obeyed His own plan for the family, even when He did not have to do so, in choosing a father for Jesus when a human father was not necessary for bringing Him into the world, conceived as the Lord was by the power of the Holy Spirit in the womb of the Virgin Mary. Let's conduct an experiment this evening (morning) and imagine how we might implement practical improvements upon the daily life of the holy family of Jesus, Mary and Joseph. For example, if Jesus had two fathers wouldn't it be obvious that he would benefit from having two men who would be able to provide a masculine role model around the clock, working in shifts to make sure he was never without? Would not two mothers better be able to give him the benefit of learning how to respect women and learn from their wisdom and experience, and to reject the temptation to like them for what they do rather than love them for who they are? "But, Father", you might respond, "that's the Holy Family! You can't even suggest such a thing! Isn't that blasphemous?" And I would respond, "Exactly: you cannot change a thing about the Holy Family. And to attempt to do so is blasphemous. But not for the reason that you might think. You cannot and should not change a thing about the Holy Family because they are a family. That is reason enough." You see, God understood that even though Mary was a single mother (and we can pretty well bet Mary would likely have been the best and most capable single mother the world would ever know because she is the holiest of all mothers), God chose a foster father for Jesus even though He could have made any other choice he wanted because He is God and therefore all-powerful. Even God obeyed His own plan for the family, even when He did not have to do so, in choosing a father for Jesus when a human father was not necessary for bringing Him into the world, conceived as the Lord was by the power of the Holy Spirit in the womb of the Virgin Mary. Every child has a right, just as Jesus did, to be loved and raised with a man-father and a woman-mother. And no one, not even God, has the right to change this truth. Marriage is not a selfish and do-it-yourself living arrangement whereby two adults come together create their own life-style, even when they claim it is about "love". Marriage is also about children, about the next generation that might come into the world through a husband and wife who cooperate with God by sharing in the marital act in a holy way. And that's the second point. Every family is called to be holy, just as the Holy Family was, by cooperating with God's plan for the man, woman and children that make up the family as the holy way of life God intended. Every family is called to recognize that family life is a holy way of life, the "domestic Church". And when families fall short and do not live and act in holy ways we do not need to change the truth about the family because we have the sacrament of God's forgiveness for serious sin in Confession. Confession is the answer that God gives in Christ for those who sometimes fail in their struggle to live up to the holiness that is proper to God's plan for marriage and family. Families are holy because families are the way to salvation for every human person. in his name this man stands before you healed." The Church is being "examined" with intensity in these days for her healing mission to people who are "crippled" in various ways: pregnant women, children in the womb, people confused about personal identity and marriage and about God and the truth itself. Some people examine what the Church does and say she is "anti-choice" even though the "choice" of directly taking an innocent child's life in the womb is never morally permissible. The right choice is God's choice: life. Some people judge the Church by describing the defense of and teaching about marriage as "hatred". This is a judgment and a libel and morally wrong also for those who cloak themselves in righteousness in their destructive and disruptive agenda to use the word marriage to describe something other than the life-long union of one man-husband and one woman-wife. The Church's role of serving the salvation of the world is in teaching right and wrong, good and evil, and to teach about the dignity of the human person in the use of freedom to choose what is right and good and to reject what is evil. Even the Church's freedom to proclaim that salvation in Christ is the reason for these and her many good works of service, teaching, healing and caring is in peril for being under attack by the godless agenda that rules in the halls of our government. The Church can not and will not obey any unjust and evil law which demands the funding of the killing of unborn boys and girls and endangering their mothers through any means whether abortifacients or abortion procedures. The Church insists upon her freedom to teach the moral truth to all those "crippled" by ignorance of the truth whether willfully and responsibly or whether without culpability as those who do not know the truth through no fault of their own. We are called to have missionary motivation wherever our vocations place us. Compassion means giving the truth to others, not pretending that one can change it in order to manipulate their feelings. It is not our role to make others happy. That is a gift for them to receive when they meet, know and love Christ and decide heroically, generously and selflessly to do God's holy will despite their personal preferences, feelings or theories. Saturday, Easter Wk III: "This saying is hard; who can accept it?" The first announcement of the Eucharist divided the disciples, just as the announcement of the Passion scandalized them: "This is a hard saying; who can listen to it?" The Eucharist and the Cross are stumbling blocks. It is the same mystery and it never ceases to be an occasion of division. "Will you also go away? ": the Lord's question echoes through the ages, as a loving invitation to discover that only he has "the words of eternal life" and that to receive in faith the gift of his Eucharist is to receive the Lord himself. Friday, Easter Wk III: "How can this man give us his Flesh to eat?" 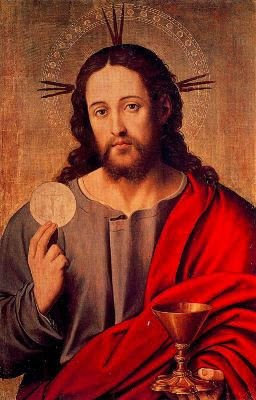 The Lord addresses an invitation to us, urging us to receive him in the sacrament of the Eucharist: "Truly, I say to you, unless you eat the flesh of the Son of man and drink his blood, you have no life in you." Thursday, Easter Wk III: "No one can come to me ... "
Saint Mark, Evangelist: "proclaim the Gospel"
Tuesday, Easter Wk III: "I am the bread of life"
whoever comes to me will never hunger, and whoever believes in me will never thirst." Monday, Easter Wk III: "the work of God"
that you believe in the one he sent. One cannot believe in Jesus Christ without sharing in his Spirit. It is the Holy Spirit who reveals to men who Jesus is. For "no one can say "Jesus is Lord", except by the Holy Spirit", who "searches everything, even the depths of God. . No one comprehends the thoughts of God, except the Spirit of God." Only God knows God completely: we believe in the Holy Spirit because he is God. Third Sunday of Easter: "The way we may be sure that we know him is to keep his commandments"
In this Easter Season our first and constant desire is to proclaim the risen life of Jesus Christ in which all of us share through the grace of our baptism. This gift is meant to grow, welling up to Eternal Life. Thus our words, actions and interior life of every day are meant to be examined for their conformity to this new and risen life of God in us. When the Church speaks out about issues that are being taken up in politics of the current day she is accused of being "political". Is it not the truth rather that those who attack the Church for speaking out when the laws of men violate the laws of God in regard to human life, marriage and the good of children are in fact in the wrong? The laws of God are the highest good and eternal truths and those who claim to follow Jesus Christ cannot at the same time support human laws which disobey and contradict God's holy will. Many today advocate divorcing love for Jesus from any association with Church, commandments, moral rights and wrongs or involvement by Christians in the political sphere. Christ makes clear that following Him places certain demands upon those who would say that they love Him which include acting on those commands in the voting booth as well as in other facets of life. People ask why Pope Benedict does not condemn more often the laws of men which contradict and oppose the laws of God for example during his recent visit to Mexico, where laws about marriage and human life were recently passed which violate the sacredness of these gifts and the will of God that they be treated with reverence as sacred things. Question: A month ago you were in Valencia. Anyone who was listening carefully noticed how you never mentioned the words "homosexual marriage," you never spoke about abortion, or about contraception. Clearly your idea is to go around the world preaching the faith rather than as an "apostle of morality." What are your comments? 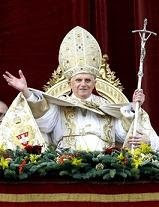 Benedict XVI: Obviously, yes. Actually I had only two opportunities to speak for 20 minutes, and when you have so little time you can't say everything you want to say about "no." Firstly you have to know what we really want, right? Christianity, Catholicism, isn't a collection of prohibitions: it's a positive option. It's very important that we look at it again because this idea has almost completely disappeared today. We've heard so much about what is not allowed that now it's time to say: we have a positive idea to offer ... I believe we need to see and reflect on the fact that it's not a Catholic invention that man and woman are made for each other, so that humanity can go on living: all cultures know this. As far as abortion is concerned, it's part of the fifth, not the sixth, commandment: "Thou shalt not kill!" We have to presume this is obvious and always stress that the human person begins in the mother's womb and remains a human person until his or her last breath. ... But all this is clearer if you say it first in a positive way. Perhaps all of us could explore more fully this "affirmative orthodoxy" of Benedict XVI. If we understand the goodness and holiness of God's plans for marriage, family and human life then we naturally oppose and try to prevent the plans and laws of men that would attack these good things of God give for us and for our benefit as an expression of His love. Thus, law and love in God are one thing for us as they have always been and will be for Him. Praised be Jesus Christ, now and forever. He is truly risen, Alleluia! 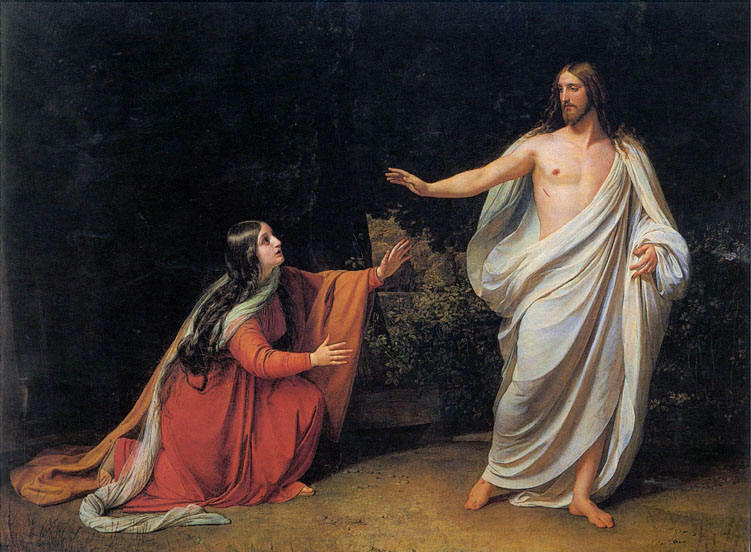 Saturday, Easter Wk II: "they began to be afraid"
The faithful should bear witness to the Lord's name by confessing the faith without giving way to fear. Preaching and catechizing should be permeated with adoration and respect for the name of our Lord Jesus Christ. Friday, Easter Wk II: "they did not stop teaching and proclaiming the Christ, Jesus"
rejoicing that they had been found worthy to suffer dishonor for the sake of the name. Thursday, Easter Wk II: "We must obey God rather than men"
We are witnesses of these things,as is the Holy Spirit whom God has given to those who obey him. Wednesday, Easter Wk II: "whoever does not believe has already been condemned"
the light came into the world, but people preferred darkness to light, because their works were evil. Tuesday, Easter Wk II: "You must be born from above." the Son of Man be lifted up,so that everyone who believes in him may have eternal life. The Church is born primarily of Christ's total self-giving for our salvation, anticipated in the institution of the Eucharist and fulfilled on the cross. "The origin and growth of the Church are symbolized by the blood and water which flowed from the open side of the crucified Jesus." "For it was from the side of Christ as he slept the sleep of death upon the cross that there came forth the 'wondrous sacrament of the whole Church.'" 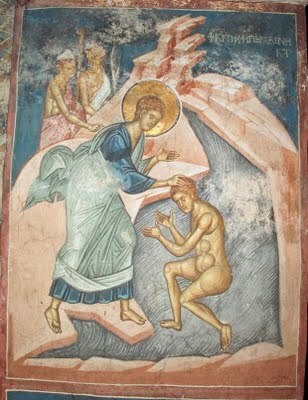 As Eve was formed from the sleeping Adam's side, so the Church was born from the pierced heart of Christ hanging dead on the cross. Monday, Easter Wk II: "enable your servants to speak your word with all boldness"
As they prayed, the place where they were gathered shook,and they were all filled with the Holy Spiritand continued to speak the word of God with boldness. 2778 This power of the Spirit who introduces us to the Lord's Prayer is expressed in the liturgies of East and of West by the beautiful, characteristically Christian expression: parrhesia, straightforward simplicity, filial trust, joyous assurance, humble boldness, the certainty of being loved. Divine Mercy Sunday: "Whose sins you forgive"
New life is found in the forgiveness of our sins! Christ makes himself present by conquering sin in the heart of the repentant believer. The sign of this new life through the presence of the risen Christ is joy, the absence of fear. In confession our communion of charity with the saving Lord is restored and its fruit is joy. The apostles were bound by the imprisonment of fear before they had received the Easter gift of peace through the love of the risen Christ. Believing it a protection from the object of their fears, they have locked themselves into the upper room. It was there that "Jesus came and stood before them...Then he breathed on them and said: 'Receive the Holy Spirit. If you forgive men's sins, they are forgiven them; if you hold them bound, they are held bound.' "
In this Easter season, we celebrate the Divine gift of the third person of the Blessed Trinity, the Holy Spirit, as an outpouring of the Risen Christ. Today the Church shares in the Resurrection and the life of Christ by the indwelling of the Holy Spirit. What does this gift mean to the Church? The peace of Christ, always ours with the forgiveness of our sins. The Catechism of the Catholic Church (CCC) teaches us what the Church has always believed by professing in the Creed "I believe in the forgiveness of sins": our gift for salvation in the Holy Spirit. The Creed links "the forgiveness of sins" with profession of faith in the Holy Spirit because the risen Christ entrusted to the apostles the power to forgive sins when he gave them the Holy Spirit. If you would be preserved "from all anxiety" as we pray in the Mass, regularly practice the Sacrament of Confession. Salvation begins now as we are released from the bonds of fear and anxiety, in the first place by the forgiveness of our sins. Confession is an Easter sacrament. Celebrate Easter: celebrate Confession. The Holy Spirit will give you the peace of confidence in Christ's saving passion and Resurrection. 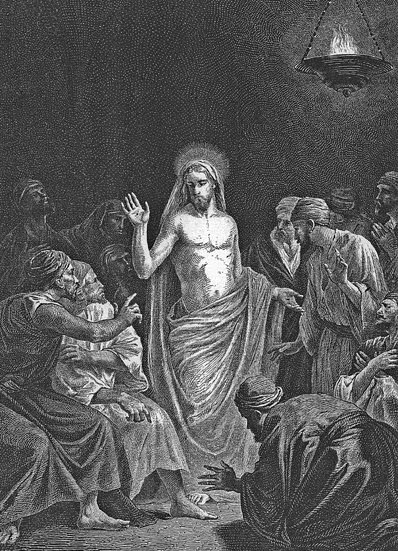 Saturday in the Octave of Easter: "The leaders ... ordered them not to speak or teach at all in the name of Jesus"
The Christian creed - the profession of our faith in God, the Father, the Son and the Holy Spirit, and in God's creative, saving and sanctifying action - culminates in the proclamation of the dead on the last day and in life everlasting. Friday in the Octave of Easter: "Cast the net"
In the office of the Apostles there is one aspect that cannot be transmitted: to be the chosen witnesses of the Lord's resurrection and so the foundation stones of the Church. But their office also has a permanent aspect. Christ promised to remain with them always. The divine mission entrusted by Jesus to them "will continue to the end of time, since the Gospel they handed on is the lasting source of all life for the Church ..."
Wednesday in the Octave of Easter: "Some women from our group ... have astounded us"
The empty tomb and the linen cloths lying there signify in themselves that by God's power Christ's body had escaped the bonds of death and corruption. They prepared the disciples to encounter the Risen Lord. "Why do you seek the living among the dead? He is not here, but has risen." The first element we encounter in the framework of the Easter events is the empty tomb. In itself it is not a direct proof of Resurrection; the absence of Christ's body from the tomb could be explained otherwise. Nonetheless the empty tomb was still an essential sign for all. Its discovery by the disciples was the first step toward recognizing the very fact of the Resurrection. This was the case, first with the holy women, and then with Peter. 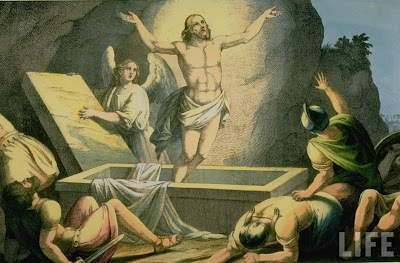 The disciple "whom Jesus loved" affirmed that when he entered the empty tomb and discovered "the linen cloths lying there", "he saw and believed". This suggests that he realized from the empty tomb's condition that the absence of Jesus' body could not have been of human doing and that Jesus had not simply returned to earthly life as had been the case with Lazarus. Happy Easter - Buona Pasqua: "He is risen, Alleuia! E risorto, Alleluia!" Wishing friends of MCITL a most joyful and prayerful Easter Season. Good Friday: "we thought of him as stricken, as one smitten by God and afflicted"
But he was pierced for our offenses, crushed for our sins, Upon him was the chastisement that makes us whole, by his stripes we were healed.We had all gone astray like sheep, each following his own way; But the LORD laid upon him the guilt of us all. 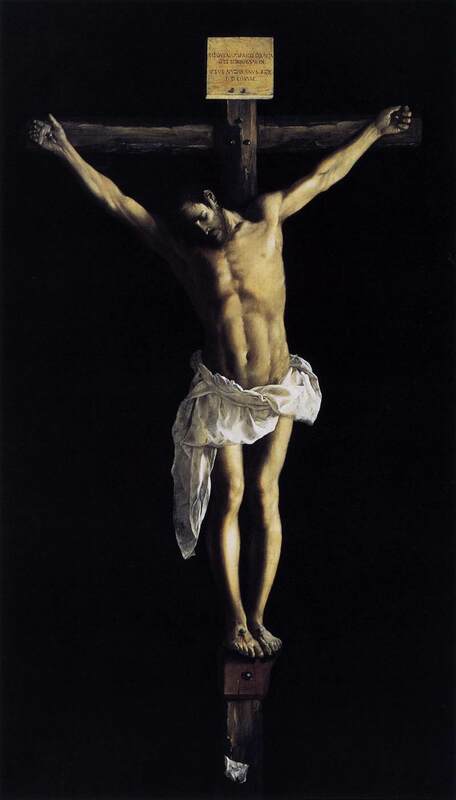 Wednesday of Holy Week: "I gave my back to those who beat me"
Jesus gave the supreme expression of his free offering of himself at the meal shared with the twelve Apostles "on the night he was betrayed". On the eve of his Passion, while still free, Jesus transformed this Last Supper with the apostles into the memorial of his voluntary offering to the Father for the salvation of men: "This is my body which is given for you." "This is my blood of the covenant, which is poured out for many for the forgiveness of sins." Tuesday of Holy Week: "Where I am going, you cannot follow me now"
In all of his life Jesus presents himself as our model. He is "the perfect man", who invites us to become his disciples and follow him. In humbling himself, he has given us an example to imitate, through his prayer he draws us to pray, and by his poverty he calls us to accept freely the privation and persecutions that may come our way.